Depending upon who you talk to, concerts are the best or worst part of singing in a choir. I’m in both camps. There is a special energy that only comes during a performance in front of an audience. But the worst part is that there is an audience. Nerves, anyone? 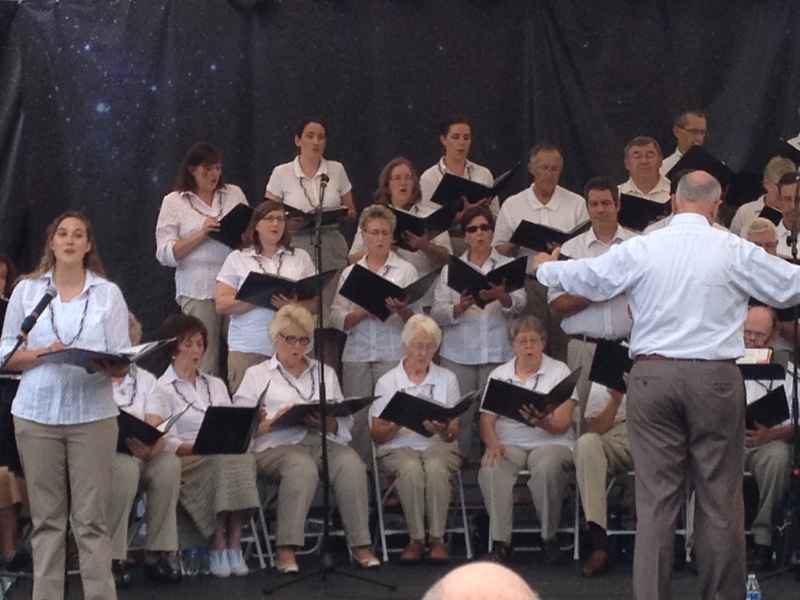 Here I am singing with the members of my choir. No, I’m not the soloist. I’m the one on the end in the middle row. And yes, most of the group are senior citizens. The front row is for those who can’t stand for the concert. ©Elissa Cruz 2015. Since my choir experience until now has been largely dictated by the public school calendar, I’ve not had the opportunity to sing very many patriotic songs in a choral setting. Sure, I have participated with various church choirs throughout the years, but the hymnbook our church uses sticks to only a few basic patriotic tunes. So this concert gave me the opportunity to learn some new music and reflect on my country and all the freedoms I receive as a citizen of the United States of America. The melody of this song is beautiful, and in the SATB version the harmonies are heavenly. It seems like today, our country is divided more than ever. I don’t understand it myself, but I also realize I don’t agree with every viewpoint out there. I have some friends whose political views, for example, baffle me. I truly do not understand some of their deeply held religious or social views, either. I don’t agree with the choices many of my friends and family have made as well. But, and it’s a big but, I can still respect another person’s opinion. And I can certainly speak respectfully to those whose opinions are not in keeping with my own. But it seems that most people today are unable to do this. We can’t just agree to disagree anymore. If I don’t hold the same opinion as you, I’m wrong. I’m stupid. I’m a bigot. I’m [insert disgustedly unpleasant opinion here]. And so I often find myself longing for our nation to heal and be one again. Maybe not one in opinion, but one in the freedom to have opinions of our own, and the freedom to share those opinions without being ostracized for them. And I do look forward to that day. I don’t know when that time will come, or how, but I do know it will happen. And all I can do is let it start with me.